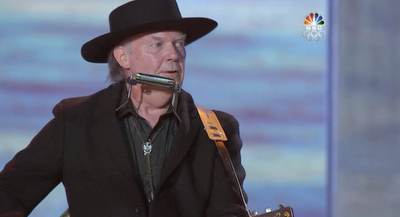 Nearly universally, Neil Young at Olympics Closing Ceremonies was considered to be the highlight based on reviews and commentaries we saw here and here. Naturally, not everyone was on-board with yet another career highlight peak. We single this comment out specifically, not because it was representative, but because of the reaction it provoked. I'm a big Neil Young fan and an admirer of the work and obvious dedication that goes into maintaining Thrasher's Wheat. However, there does appear to be a tendency towards uncritical hero worship on this website. Praise is a lot less meaningful when it's offered reflexively. "Did you see him on the Tonight Show last Friday? My 12-year-old, the handsome and brilliant Preston, watched alongside me in stunned disbelief. Preston goes for a fair range of styles and decades -- Jason Mraz, Blue Oyster Cult, Kanye West, Dead Kennedys, Eric Johnson -- but none of it bears a remote resemblance to an elderly dude in a Hawaiian shirt blinking and twitching and strumming a guitar. "Oh my God," he said, "even you're better than this, Dad!" I don't know an awful lot about the fellow (though I know a lot of his songs well enough to play and sing them -- he's one of those high-prestige Baby Boomer artistes whose products I find I don't need to buy for pretty much the same reason I don't buy recordings of snow shovel noises to put on speakers on my front lawn)..."
This is obviously an uninformed viewpoint, but it does serve to remind us that not everybody thinks Neil is a God. Neil would probably prefer it that way. We'll just say this. Never, ever, in all the years that we've been editing Thrasher's Wheat have we seen such a false equivalency. The very attempt to balance Neil Young's performance of "Long May You Run" at the 2010 Olympics Closing Ceremonies and a 12 year old's impression of watching Conan O'Brien, is well... just not really worth bothering to analyze. As Glenn Greenwald would blog, "Could a false equivalency be any more trite or vapid than that?" You know, the real 'problem' (if you can call it that - to me it's more of a blessing rather than a problem) is that there's a lot of people who think Neil's a rockstar, some famous artist in the music scene. And therefore they judge his output and the things he does / doesn't just like they judge any other star or artist, like (no offence in any way) Aerosmith or Michael Bublé or whoever. But he's not. It's just the fact that Neil has kept his personal integrity (his being) in EVERYTHING he records or does / doesn't that sets him apart and puts his music in a complete different place. It's just TRUE. Nothing more. You can take it or leave it, but it will stay the same: TRUE, in every meaning of the word. Everybody's Rockin is one of many albums that was not recorded for the sake of selling as many copies as possible. Come to think of it, I think none of his albums were. Not even Harvest itself. Neil didn't know it was gonna be his hitalbum, and if he did, he certainly did'nt aim for it. He steered out of the MOR when he found out. And yes, that's irritating sometimes: to see someones work judged by all the wrong measures. But hey, you can't blame people for not seeing what seems to be so obvious to us. They just don't get it. Sorry for them. And I'm not pointing at anyone who posted on this page, this is just a general observation. It took me quite a lot of years to learn this from Neil. I wasn't happy from the year he put out RE-ACT_OR up until the Blue Note's. They're all out there, his records. And they all have some place where they fit in. It's a fascinating musical biography. "And when the dawn breaks I see my fellow man/ and on the flat-screen we kill and we're killed again/ and when the night falls I pray for peace/ try to remember peace." "And yes, that's irritating sometimes: to see someones work judged by all the wrong measures. But hey, you can't blame people for not seeing what seems to be so obvious to us. They just don't get it. Sorry for them." Thanks, Peter, for pointing out the obvious. I've known this, but never really learned it. It's not a battle worth fighting. I also can see the part I've played for way too long in: "toughness multiplies toughness in a descending spiral of destruction." It's time to move on, and focus on the light. Don't know why the detractors have always managed to get to me. It says more about me than anything else. It's time to just be content with having Neil to appreciate, and let all the rest go. This is well & fine. But here's a question: Who else today could have stood in Neil's shoes on the olympic stage? Setting aside the made in Canada requirement. It's a very short list to pull off something like that solo. Lots of pressure. Big Neil fan, hence my attendence...I would have been happy to see RUSH play a number or two. How about a never expected or heard collaboration...Graet talents surely could have pulled it off. to do "18 Inches of Rain" at the closing....:>) Naw! What I actually would have loved to see is Neil and Ian do "Four strong Winds" together. I hear Neil wore out a jukebox long ago listening to that song. What you see is what you get though, and Neil Young anywhere live is just a heck of a lot of soulful fun! As for me..."I had life once but my job ate it." I just dig it, I don't question it, I take it as it comes. It's Neil in full uniform! dig it! Neil Young is like sushi,either you love it or you loathe it.There's no in between.If you happen to love it it's heaven , if not it's just stinkin' raw fish.I wish my best friend would feel, let's say ,On The Beach like i do but it just won't happen and that's just fine.Hey Neil!I've got the title for your next album:California Roll. Well said I agree and have had the same wish to see Neil & Ian doing 4 strong winds. "What I actually would have loved to see is Neil and Ian do "Four strong Winds" together. I hear Neil wore out a jukebox long ago listening to that song. I didn't loose my life for 20years to a job I lost one of most magical parts and have been trying to get that same feeling back since Chrome Wheeles 2. but can't. In those 20years the times I would hear Neils stuff on the radio going to a meeting, site, funeral etc it would bring back memories mostly good than bad times I had at the same releaving stress and preasures and reminding where my feet stand. When my days are dark I do admit I reach for Neils CDs Neils music is like a transporter that trnsends time. I was really lucky that I was born when I was. And with you I feel no hidden path"
He knows his audience!!! and does it so poeticly simple, it's mind blowing. time to roll another number. Thrasher, you are so right when you say "false equivalency" here. Would anyone expect a Pepsi-drinking 12yr old to appreciate a fine vintage wine, aged in oak? Would you base your judgement of a painting by Van Gogh or Monet (also mavericks in their time) according to the opinion of a 12yr old? Neil has spent almost 50 years maturing, refining and crafting his art, and while his recent appearances may appear simple to some, to those who understand and appreciate Neil they represent a lifetime`s dedication to his muse, unerring truthfulness and pure soul. Thank you Greg M for your insightful post. I too have learned that one must choose ones battles carefully. Your words reveal wisdom rarely seen today, and I can see you have chosen the path less traveled... Be the change you want to see in the world and the world will change. But the prairies made me what I am today! I don't think Neil could have said it better. Nice, but I would of loved to of seen Neil perform something that could of been just as apt from his vast repertoire...Maybe "You and Me"or "Motion pictures" I don't know...it just would have been a nice touch.